Faculty member Barry Hufker and students Beth Augustin and Kayla Rogers represented the audio production program at Hazelwood's 2016 STEM Fair. Bill Barrett, director of the May Gallery and professor of Photography in the School of Communications, spoke at the annual conference of the Association of Texas Photography Instructors (ATPI) in Austin, Texas, last month on "The Idea of the Camera: The Camera Obscura and the Journey to Photography." His camera obscura research project is supported by a Faculty Research Grant from the Office of the Provost. Sheila Hwang, associate professor of English in the College of Arts & Sciences, presented some of the research from her 2015-16 Faculty Research Grant at the South Central Society for 18th-Century Studies held Feb. 25-28 in Oklahoma City. Her paper was titled, "'The Likeness of a living Face': Capturing and Creating England in A Tour thro' the Whole Island of Great Britain and Eighteenth-Century Maps." On Sunday, March 13, Hwang will present on campus for the St. Louis Region of the Jane Austen Society of North America. She will co-present with Jennifer Frangos from University of Missouri-Kansas City at 2 p.m. in the Pearson Hourse, Room 2. It is free and open to all; light refreshments are provided by St. Louis JASNA. Don Corrigan, professor of Communications and Journalism in the School of Communications, recently presented "Talkin' Weird Weather with Climate Skeptics" at the West County Democrats monthly meeting. He also presented "Floods of Missouri & Meramec Valley" at the February 2016 general membership luncheon of the Kirkwood Chamber of Commerce. Barry Hufker and audio production students Beth Augustin and Kayla Rogers participated in the recent 2016 STEM Fair at Hazelwood Central High School. 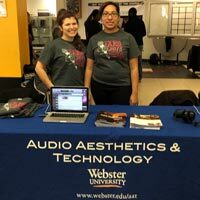 Augustin and Rogers are officers in the Webster University student chapter of the Audio Engineering Society (AES). Hufker, Augustin, and Rogers met with students and their families to discuss careers in audio production and the Webster University School of Communications Audio Aesthetics and Technology (AAT) department's curriculum. Attendees of the fair were able to hear themselves sing and talk through a professional studio microphone, listen to the elements of a music recording session, and analyze the sonic elements of audio for video and film. This is the third year members of the AAT department has represented the School of Communications at the STEM fair. Separately, Hufker spoke at Galactic, the Hazelwood School District’s gifted program for grades 1 through 5. He was a guest in Kasey Healey’s 5th-grade class. Hufker presented “Sound: Careers and Hearing Conservation.” This is the second time Hufker spoke in Healey’s class. In March 2015, Hufker talked to her students about careers in audio production, a brief history of sound recording, and sound as it is found in entertainment.